Thanks to Dr. Eman Abdelzaher, Alexandria Faculty of Medicine (Egypt), for contributing this case and the discussion. To contribute a Case of the Week, follow the guidelines on our Case of the Week page. Further enhance your staining experiments with EXPOSE IHC (click here) detection systems offering reduced background and greater sensitivity than polymer detection systems. 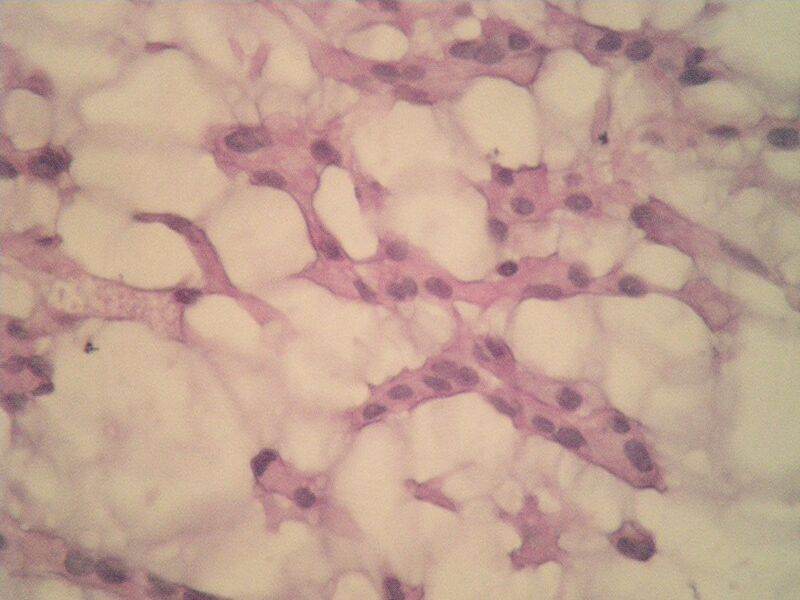 In addition, discover extensive resources (click here) to troubleshoot your IHC experiments. (1) Our Feature Page for the month highlights Computer software and systems, and includes Milestone Medical and Voicebrook. Also check out our new monthly Mystery Image, on the right side of the Home Page. (2) We are constantly looking for new Reviewers for our 7,000 topics, which we want to update every 1-2 years. Visit our newly updated Instructions for Reviewers page for more information. (3) The Table of Contents of our Stains chapter now includes all 360 stains / biomarkers described in the chapter. The CD Markers chapter contains an additional 260 markers. We update these pages regularly, but let us know of any new markers we should include or other changes we should make. A 39 year old woman presented with headache. CT showed a 6.5 x 6 x 4 cm extra-axial dural-based lesion at the right temporo-parietal region. Intense homogenous post-contrast enhancement was noted. 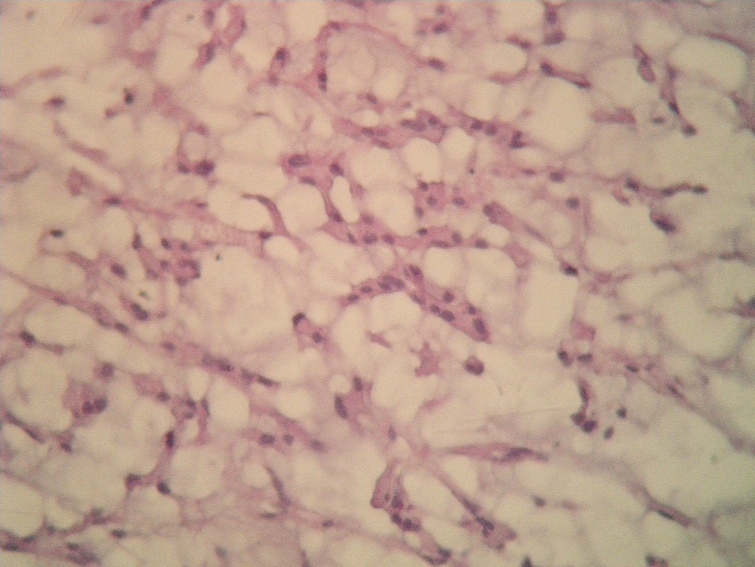 The lesion exerted mass effects on the surrounding structures. 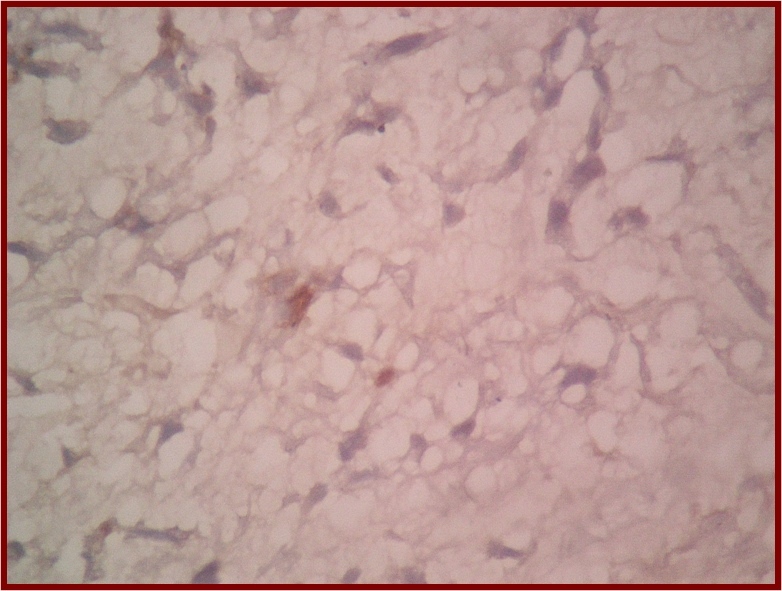 Underlying bone showed mild hyperostosis. Gross total removal was performed. 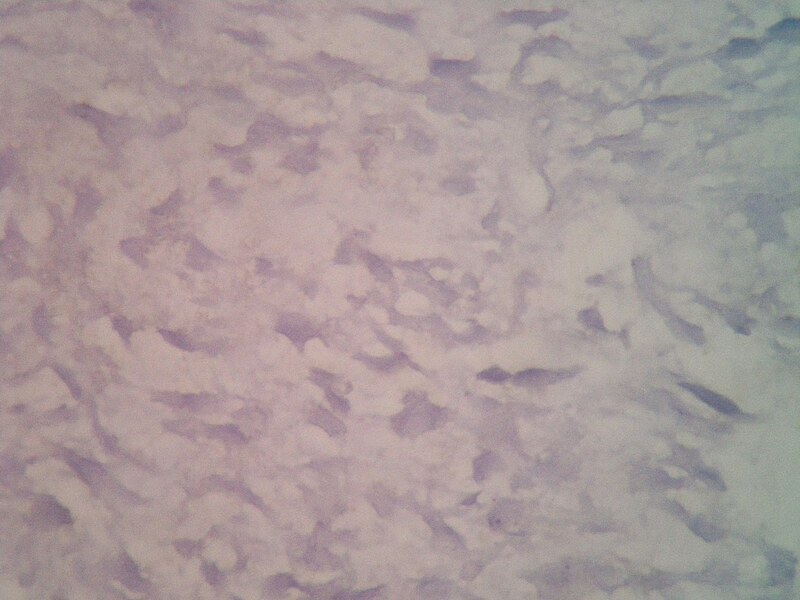 Multiple soft tissue fragments (10 x 8 x 3 cm in aggregate) were bluish with a gelatinous appearance. This case is an extra-axial dural-based enhancing supratentorial lesion in a 39 year old woman associated with hyperostosis. 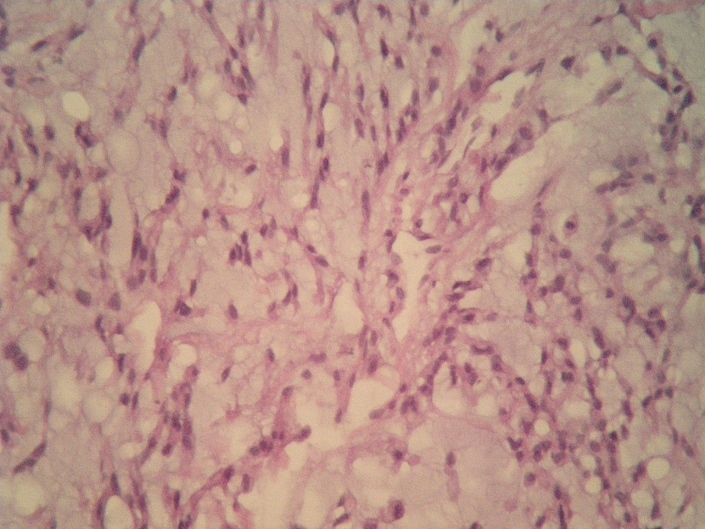 These features raise the possibility of meningioma, but the tumor had chordoid features, and did not look like a classic meningioma at macroscopic or microscopic examination. Achieving the correct diagnosis requires correlation with clinicoradiological data and adequate sampling. 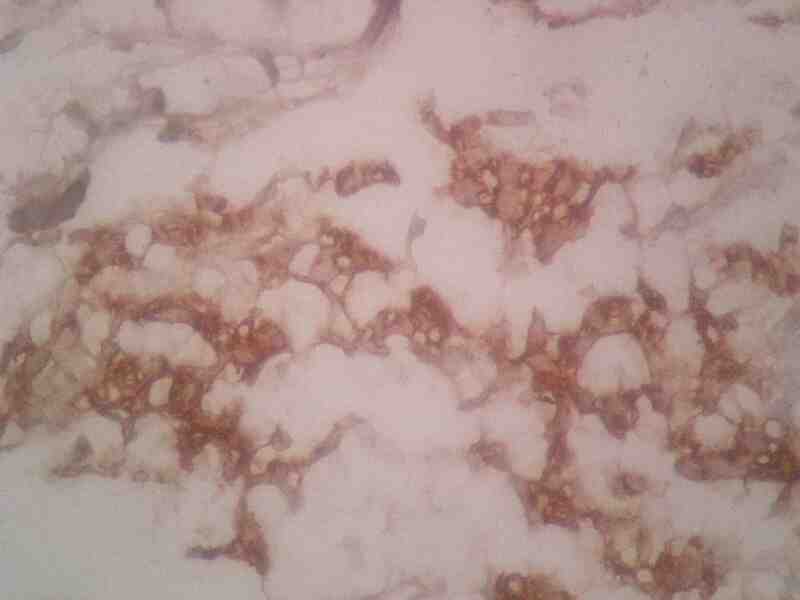 Immunohistochemistry is also helpful. 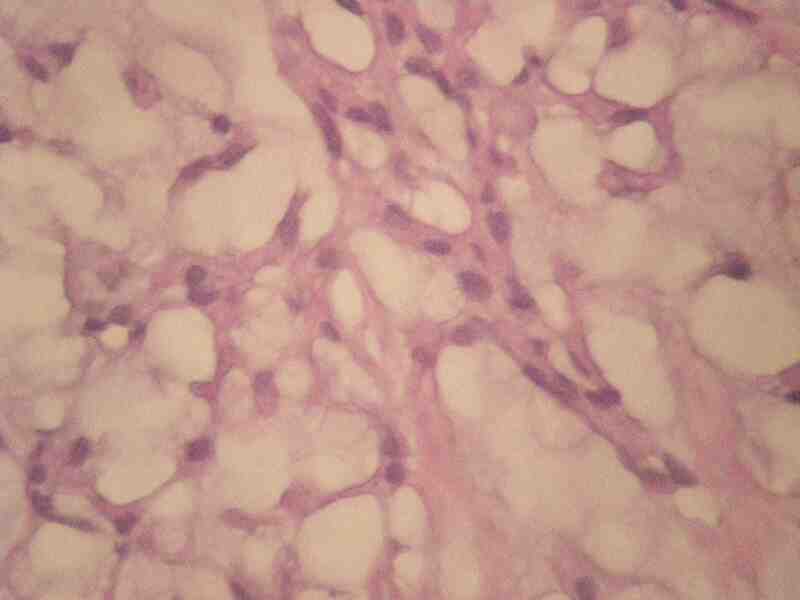 In conclusion, Chordoid meningioma, WHO grade II, is an uncommon variant of meningioma with an increased likelihood of recurrence. Therefore, recognition of this entity is important and its distinction from cases that show overlapping morphological features is essential.